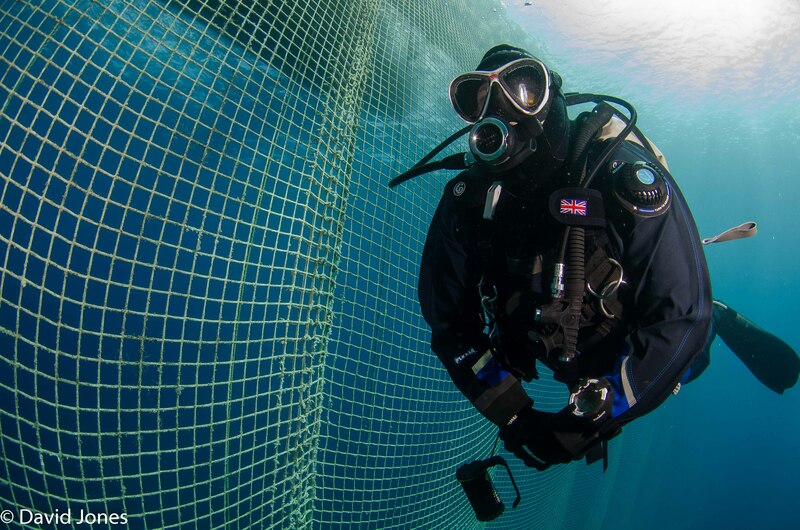 MALTA & GOZO WAS RUNNER-UP in the most-recent DIVER Magazine Awards in the Destination of the Year category, so it would be fair to say that a lot of UK divers like it. 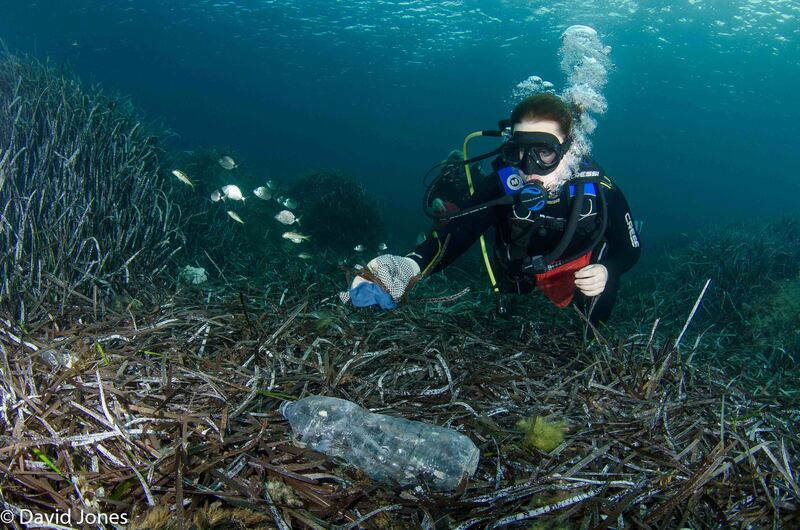 I have been diving there for several years now – and I love it. But my last trip gave me an unexpected opportunity. Like me, many of you may have seen the floating pens in St Paul’s Bay and around the coast, but I had never paid them much attention. 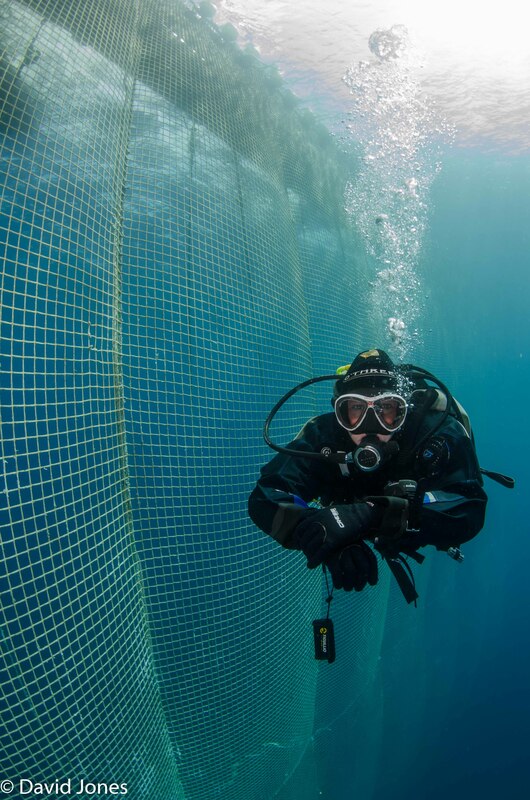 I had assumed that they were part of the fish-farming industry – aquaculture – that is quite common in the Mediterranean. On a recent trip I found out that some of the pens were just that, the final part of the cycle for the breeding and rearing of sea bream and bass. However, it transpired that others were full of bluefin tuna (Thunnus thynnus), the tigers of the sea – ferocious, fast-swimming giants among fish. I wondered if I could get to swim with these magnificent animals. I hadn’t considered getting into one of the pens, but after a few enquiries I was offered the opportunity to jump into one of the bigger ones in the south. My plan had been to do a simple photo-shoot, possibly with a little background information about the bluefin – it seemed a good chance to get some decent shots of lots of big fish. As usual, I did a bit of research before the shoot, and that was where my problems began, because the deeper I delved into the bluefin tuna trade, the more concerned I became. Distinct from the bream and bass pens, the bluefin tuna are not reared but captured fish, and are held often for several years. To the fishermen and the pen-owners this is a sustainable practice – far more so than taking everything to market as soon as it is caught. “No point catching and killing fish if no one wants it,” they would say, and initially that sounds like a reasonable position. I get the fishing company’s financial arguments about reduction in fuel and number of fishing trips, but by focusing purely on economics they are missing the point. 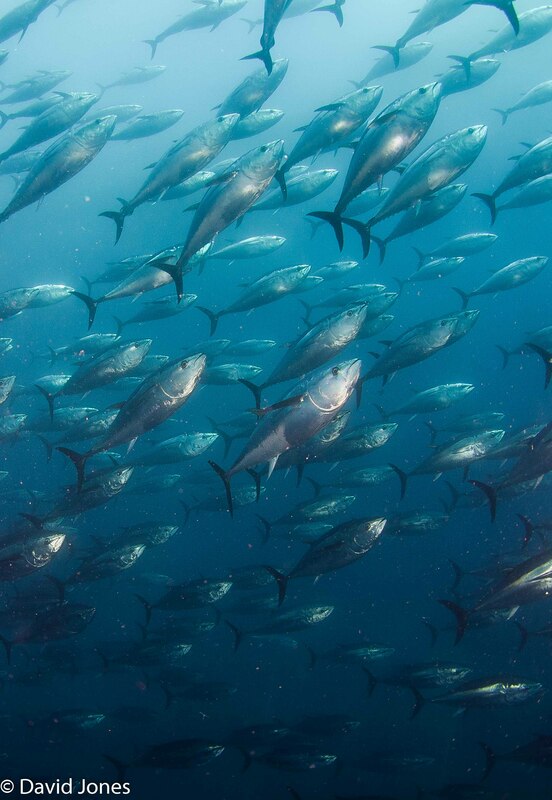 Bluefin tuna move constantly in search of food and migrate seasonally, often over incredible distances. Huge migrating schools are the target for this capture-based aquaculture. Schools are spotted from the air and, once located, huge purse-seiners move in. The tuna have little chance of avoiding detection. Once captured, they are transferred to towing cages, a stressful activity that can lead to the death of many fish. It can takes weeks, even months, for these cages to reach shore. These modern fishing techniques and tuna “ranching”, as it is called, have taken an incredible toll on the species. Not that long ago, small local fishing-boats would bring in bluefin tuna as part of their daily catch, but that is now extremely rare. 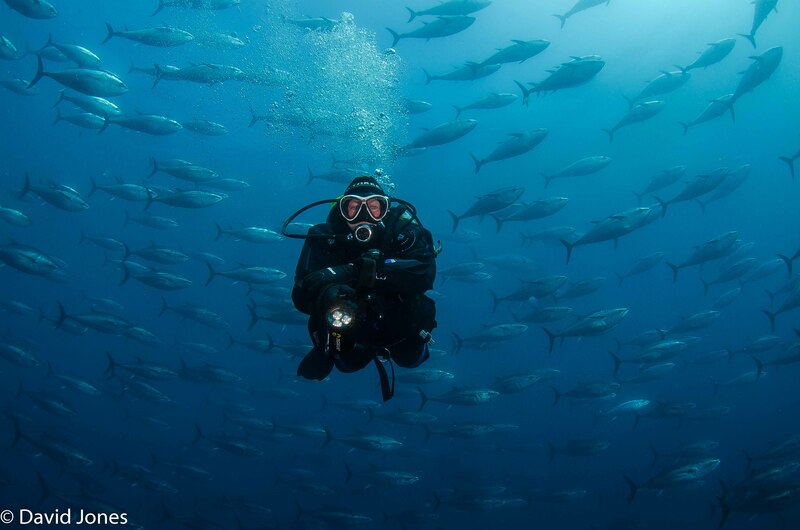 Bluefin numbers in the Mediterranean are now at a critical level. They are currently an endangered species, with estimates of extinction set at around 20 years. It’s strange to remember that, until the 1960s, tuna was seen as a poor man’s substitute for salmon or sardines. The reason for this growth Four-fifths of the world’s bluefin tuna is sold to Japan for sushi, and it is an enormous market that commands outrageous prices. One fish was sold in Tokyo in 2013 for US $1.76 million. Increasing demand and diminishing supply causes even higher prices, making capture-based aquaculture even more attractive for anyone looking to make big profits. It is a never-ending spiral of depletion. 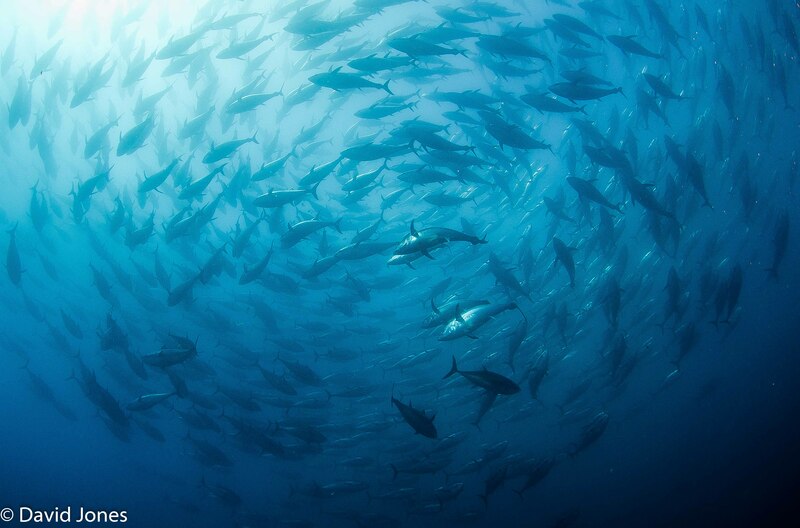 TUNA RANCHING IS ASSISTING this tragic nosedive towards extinction, because by removing the tuna from the wild, breeding stock is effectively removed. 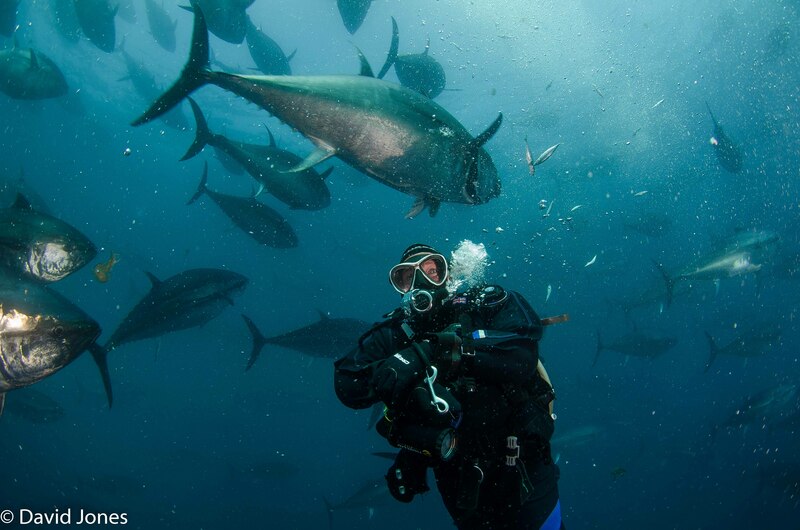 The tuna are captured at various stages of their life-cycle, from juveniles weighing less than 8kg to large specimens. The capture process doesn’t differentiate. Those fish taken before sexual maturity (5-8 years) miss the chance to procreate, a real pity for a species in big trouble. Those animals that are sexually mature fare little better. Although they can be held in their five-star pens for several years, they don’t seem to provide the right environment for tuna loving. Even if they did, it is unlikely that the eggs would survive. When you dive with this swirling mass of fish, you’ll find yourself in a vortex created by them, and which quickly drags you to the bottom. Any eggs would simply be sucked down to be devoured by mud-dwellers, or eaten by the smaller fish that hug the safety of the nets. Without breeding stock, the species cannot recover. Another major issue is feeding. In the wild, tuna would grow at a “natural” rate. When food is plentiful they would grow quickly; when it is not, they wouldn’t. Tuna-ranchers want their fish to gain weight as quickly as possible. They are fed oily fish (mackerel and sardines primarily) in huge numbers. Where I swam, each pen was fed the equivalent of 1 tonne of young mackerel every two days during winter, and every day during the summer to ensure that the tuna achieve their maximum weight in the minimum time. The 300kg fish with which I swam in one pen were expected to reach 500kg within about eight months. This one farm alone was using thousands of tonnes of immature mackerel every year. The baitfish are not “landed”, so there is no restriction on their capture, but neither has there been any research on the impact of this industry on baitfish stocks. The issue of landing fish brings me on to another problem. Having what is effectively an offshore process makes it incredibly difficult to regulate this industry. 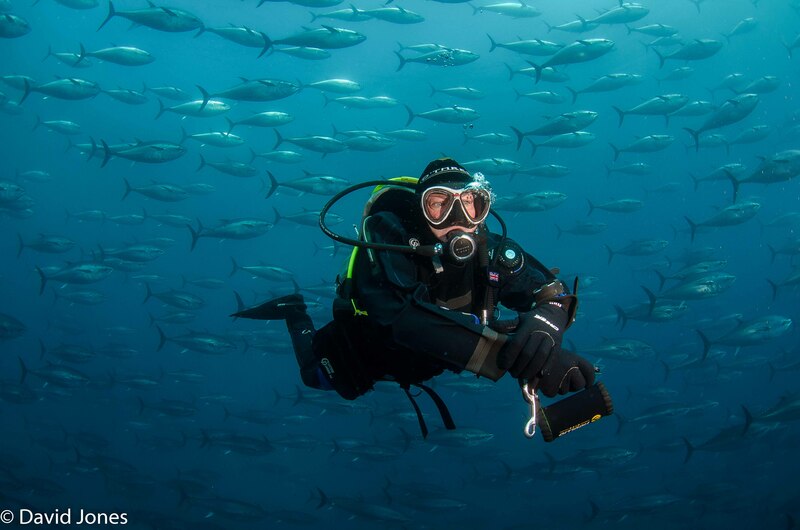 The International Commission for the Conservation of Atlantic Tuna (ICCAT) has established limits on fishing but how, when the numbers of fish are estimated by divers, do they keep track of what is going on? ICCAT may have banned the use of aerial reconnaissance in capture, but it continues. Without the ability to determine what is being taken out, accurate stock assessment is at best a guess. Bluefin tuna are captured, farmed, sold and processed offshore. How this is managed to ensure their survival is an enormous challenge. 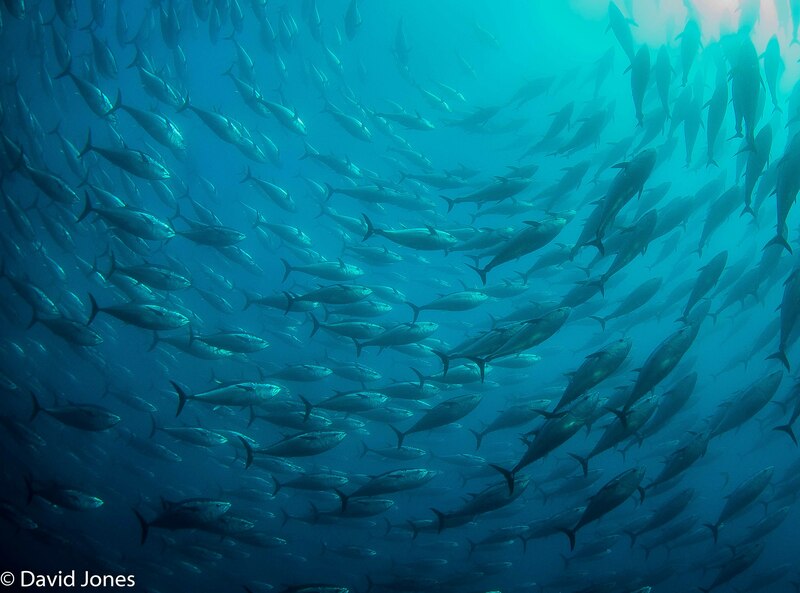 THE DECLINE IN BLUEFIN TUNA sums up everything that is wrong with the fishing industry – technological advances that enable us to catch fish on an enormous scale, economic forces that don’t take environmental sustainability into consideration, profit overcoming common sense, consumer indifference, and ineffective legislation and enforcement. It is not the first species to fall foul of the existing situation, and it won’t be the last. A huge investment is being made by one corporation of the giant Mitsubishi empire to buy up thousands of bluefin tuna. It handles around 40% of the bluefin that comes into Japan and has huge stockpiles of frozen fish. As supply continues to get smaller, prices will rocket. Is Mitsubishi actually speculating on extinction? It’s a frightening thought! 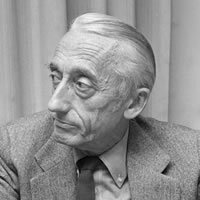 IT IS INTERESTING THAT JACQUES COUSTEAU THOUGHT FARMING WAS THE ANSWER. I don’t actually think he was wrong, just that we have not got it right and no, I don’t have the answers to the problems faced by bluefin tuna – they are far-reaching and will involve cutbacks in fishing fleets, changes in legislation and, more specifically, culture, something that is far more difficult to achieve. There have been extensive attempts at farming tuna in Japan (I’m sure they are well aware of the impending threat to their favourite dish), but with limited success. Management has to be the solution. My original premise for jumping in with the tuna was overtaken by concerns developed during my research, and reinforced during my dive into the pens. Seeing thousands of these wonderful animals swimming in endless circles was spectacular, but ultimately very sad. The article is not what I had originally planned, but as Dr Sylvia Earle once said: “People might not care even if they do know. But they can’t care if they don’t know.” In spite of not having the answers there is one aspect on which I can personally have a direct impact, albeit small, and that is consumer choice. I chose not to eat tuna. If the economic forces of supply and demand are driving the species to extinction, perhaps this is the only answer because fish quotas and legislation are yet again failing the ocean. I can’t influence the appetites of the Japanese, but Bluefin tuna is definitely off my menu; is it off yours?